The winding pool and it's lush greenery look a lot like a real desert oasis. Head to the nearby Talking Sticks Golf Club for some stunning play. Sleek hardwood floors and leather couches give a touch of class to each residence. Forgot fluorescent, this gym has floor-to-ceiling windows that let in the sunshine. Located in North Scottsdale, Meridian CondoResorts is TripAdvisor’s #1 Speciality Lodging Resort in Scottsdale. Once you get here, you can shift into full vacation mode. The resort’s laid-back atmosphere allows you to indulge in days filled with “want to’s” instead of the usual “have to’s.” The resort has two outdoor pools, a freeform pool and a lap pool – try them both and pick your favorite. (Pro-tip: the water features in the freeform pool will be a big hit with the kids). Or lounge poolside and work on your sun-kissed look. The state-of-the-art Fitness Center with a variety of exercise equipment is open 24/7, so it’s ready when you are. Reward yourself for your vacation-planning skills with a massage, facial or manicure at the resort-recommended Canyon Falls Spa and Salon, just a ten-minute drive from the resort. Spacious one- to three-bedroom condos sleep up to seven guests, and central air-conditioning in all units allow you to escape the desert heat. Full kitchens have everything you need to make everyone’s favorites. Recruit the kids to help bake your famous fudge brownies – not that they’ll need convincing. Catch the big game or your favorite show on the Flatscreen TV in the living room. Flip a coin to decide who’s in charge of the remote control. Vacations are much better when every member of the family can come along – including the ones with four legs! Meridian CondoResorts is dog-friendly and will allow two dogs (with a combined weight of up to 80 pounds) per condo. Golf Magazine describes Meridian CondoResorts as “The premier provider of luxury golf packages and vacation rentals in Scottsdale.” Choose between several courses ranging from Championship to Premium Plus, depending on your skill level. Nearby championship courses include Coyote Lakes and Palm Valley while Eagle Mountain and Sunridge Canyon are Premium Plus. The Resort Concierge will be happy to assist you with everything from deciding which golf course is right for you to dinner reservations. Salt River Fields at Talking Stick, the Spring Training home of the Arizona Diamondbacks and Colorado Rockies, is just a six-minute drive from the resort. The shopaholics in your crew can head to Kierland Commons. This outdoor shopping mall is only a 13-minute drive from the resort and features a variety of stores from J.Crew to Talbots, get your caffeine fix at Starbucks and surprise the kids with a stop at See’s Candies. - Note: Each condo complex has a different layout, therefore resort amenities such as pools differ in their shape and size. Cribs (infant beds) are available for USD 15.00 per day. Pristine golf courses stretch for miles with rugged desert mountains and cacti in the background. 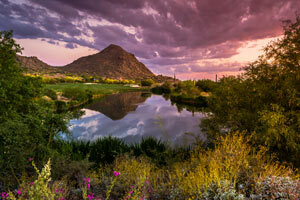 Scottsdale is an oasis of spas, PGA golf courses, and designer shopping malls.